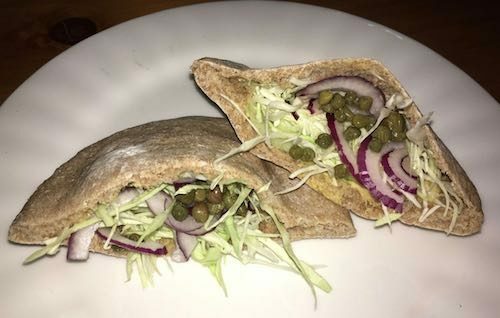 Last week a friend was telling me about his wife making pita brea. “Of course,” he said “when you make it at home it never puffs up into a pocket.” Au contraire! Mine does! With a couple simple tools, you too can make beautiful, pocketful pita bread at home. 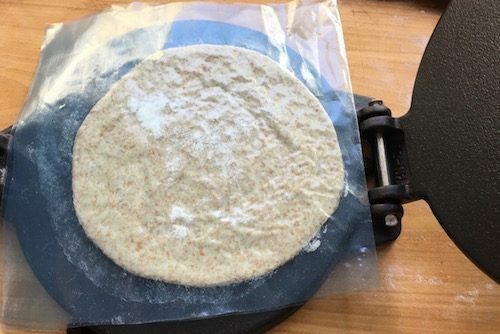 I’ve been making pita bread for years–ever since I got my first pizza stone. A baking sheet just doesn’t get hot enough to properly bake pita bread and get it to puff into a pocket. A pizza stone, however, is a perfect pita baking surface. 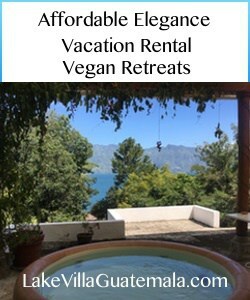 I use one similar to this one from Amazon. I’ve alway rolled my pita bread into rounds by hand, but a new kitchen toy completely changed my pita game. What was it? This awesome cast iron tortilla press. My pitas are round and even with little effort. An aside: the corn tortillas in Guatemala are the absolute best, and the women who make them pat them out by hand. You almost never see tortilla presses here, and if you do, they’re the horrible cheap aluminum variety. I don’t make my own corn tortillas because the local women do such a magnificent job. I do, however, like to make whole wheat chapati. So I bought the cast iron press from Amazon the last time I was in the U.S. and carried that heavy sucker back in my luggage. 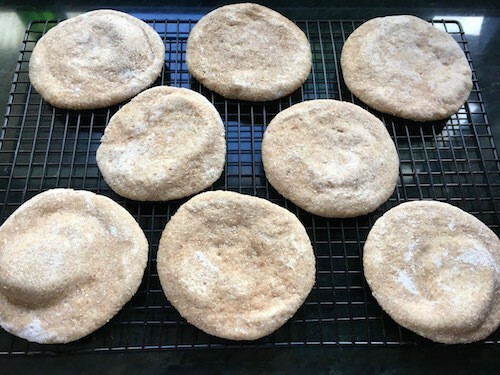 What I didn’t know was how it would change how I make pita bread. This recipe is all about method. You can use pretty much any sourdough or yeast wheat bread dough (gluten-free dough won’t puff up and form pockets). 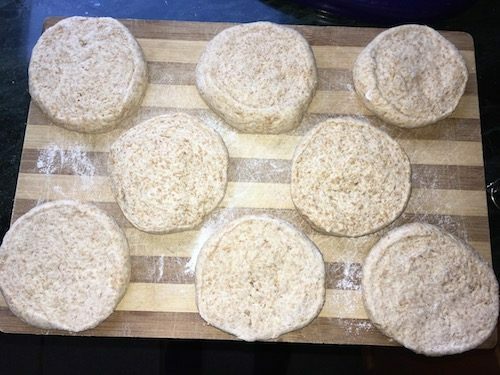 I regularly make whole wheat sourdough bread, and the dough is great for pitas. 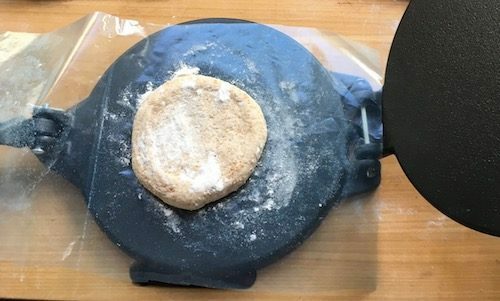 It does require special equipment: a pizza stone, a tortilla press, and a trimmed plastic zipper bag or parchment paper. I thought I would like using parchment paper better, but it turns out that a trimmed zipper bag is easier to use, lets you see the dough better, and and be washed and re-used. The directions sound a bit complicated with all the turning, but it’s really not difficult or time-consuming. When you get into a rhythm it goes fast. The idea is just that you’re turning the dough in the press to flatten it evenly. Baking is even faster: with some practice, you can have the whole batch done baking in about 7 minutes. Note that the pizza stone must be inside the oven as the oven preheats. A cold pizza stone placed in a hot oven can crack! The secret to having the pitas puff up is a very hot oven and pizza stone. 1 recipe bread dough of your choice (to make one loaf), prepared through one rising. 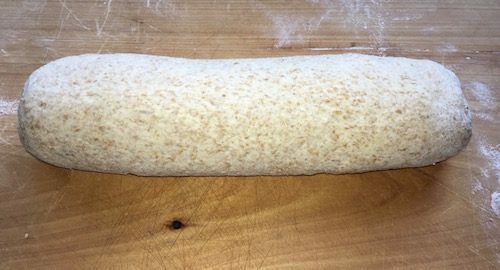 Punch down the dough and shape into a log about 8-10 inches long. You want the log to be pretty round. On a lightly floured board, slice the dough log into 8 even pieces. I like to cut the log in half, then cut each of those in half, then cut the four pieces in half. I find it’s easier to get the slices even that way. 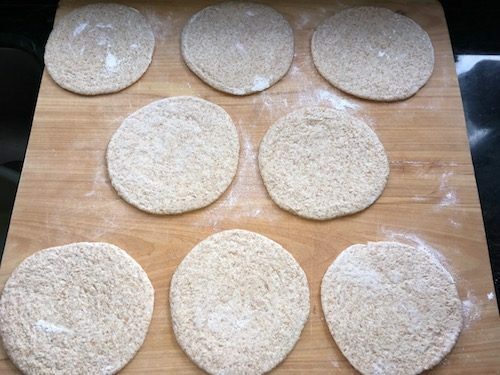 Gently flatten each of the 8 dough rounds on the lightly-floured board. Cover with a kitchen towel so the rounds don’t dry out as you work with them. Preheat the oven with the pizza stone inside to 490 degrees F while you press the dough. Cut two pieces of parchment paper to the approximate size of the tortilla press. Place one piece of parchment paper on the bottom of the tortilla press. Lightly dust the parchment with flour and place a dough round on top of the parchment. Lightly dust the dough round with flour and place the other piece of parchment paper on top of it. Put the top of the tortilla press down and use the handle to flatten the dough. 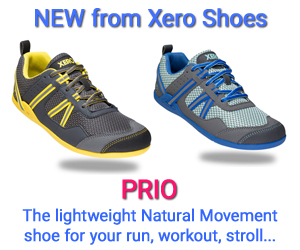 You don’t need to use a lot of force–you’ll be pressing it several times. Open the tortilla press and turn the dough (and its plastic) 180 degrees, so the part that was next to the handle is now next to the hinge. Press again. Turn the dough and parchment 90 degrees and press again. Then turn 180 degrees again and press. Now you’ve pressed the dough in all four directions and the dough is between 1/16″ and 1/4″ or 1.5 and 3 mm thick. Peel the plastic off the dough and place the pressed round back on the lightly floured board. Cover with a towel to prevent the dough from drying out. Repeat the pressing process with the other dough rounds. Repeat the baking process with the rest of the dough rounds. When you get the hang of it, you can bake several at a time. My pizza stone is large enough for me to bake four at a time. Allow the pitas to cool completely before using or storing.